EVERY time Alla Chapples leaves her Primrose Hill flat she is reminded of her father, Yuri Ouvarov. Her home in St Edmund’s Terrace is just a few minutes walk from the Regent’s Park tennis court where her father, a Russian tennis coach, hung himself last December. The former Hampstead School pupil’s wedding – just one month after the tragedy – was fraught with sadness as her husband Murray, 33, had also lost his father shortly before their big day. But happiness returned to the Chapples household this week after Alla, 26, gave birth to a gorgeous baby boy, Zac. She said: “I am just so happy when I hold my little baby boy. He’s so lovely. He sleeps all the time. When he wakes up he just looks around with his big blue eyes and then I feed him and he goes back to sleep. “Obviously it was really difficult after what happened in the winter. We had our wedding, but it was difficult. “I take Zac to Regent’s Park most days because that is where I feel his granddad is. 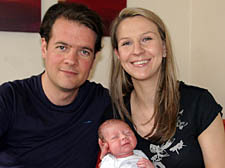 Zac Chapples, who was born on June 4 at University College London Hospital, will be forever reminded of Ms Chapples’ father. His middle names are Murray after his Dad – a family tradition – and Yuri, after Mr Ouvarov. The respected tennis coach – who left Russia with his wife Tatiana and daughter in 1991 to give his family a new start in life – was found hanged in Regent’s Park, where he worked for 16 years at the popular sports school. His death came nine months after the closure of his beloved Regent’s Park Golf and Tennis School, which had its lease terminated by the Royal Parks Agency. The 54-year-old Russian – whose pupils included actress Amanda Holden and television presenters Dr Gillian McKeith and Des Lynam – was found at his favourite tennis court. Westminster coroner Dr Paul Knapman, at Mr Ouvarov’s inquest in March, said he had been driven to take his life after struggling to find work following the closure of the school, which was months short of celebrating its 100th anniversary. The Golf and Tennis school was still in a barren state this week. A padlock and chain bars entry to the school, despite calls for it to be reopened in Mr Ouva­rov’s name. Alla Chapples said she was looking forward to getting back to work promoting her health food business. She is already a director of her company Two Chicks, which supplies free range liquid egg whites – a healthy option to the full yolk variety.